I didn’t investigate whether Novacut had a feasible plan. My pledge was an expressive vote for the concept of new tools for distributed collaboration. Novacut is making another go of it at Kickstarter, and it looks like they’ll succeed. I just pledged again. However, I’m saddened by how much of philanthropy is not also carefully instrumental. The only low barrier way to move in this direction (I’d prefer futarchist charity) that I know of is criticism, so hats off to Danny Piccirillo for his criticism of Novacut fundraising. I’m further saddened that such criticism is not welcomed. I would be honored that someone found a project I am involved in or a fan of worth the time to criticize and thankful for the free publicity. Now, I’m looking forward to see what Novacut delivers, and/or what Novacut ideas other video editor projects implement. Speaking of delivery, I noticed today a new crowdfunding site targeting free software and Brazil, makeITopen. According to a writeup, it appears to have a couple interesting twists. Projects that do not reach their thresholds have donations not fully returned to donors, but only as credits within the system (unlike Kickstarter and others, where pledges are not collected until a project has reached its threshold). More interestingly, there is a process for donors to approve (or not) the software delivered by the project. This sort of thing is probably hard to get right, and I fully expect makeITopen to fail, but I hope it is hugely successful, and think that getting approval right could be very useful. At least for donors who wish to be instrumental. Addendum 20110730: The best two comments on the Novacut criticism kerfuffle: Jono Bacon saying be calm, but onus is on Novacut to explain, and Jason Gerard DeRose (Novacut lead), explaining how Novacut’s intended high-end userbase demands a different program than do casual video editors, and that there’s plenty of scope for cooperation on underlying components. Congratulations to Novacut for meeting its Kickstarter threshold, and good luck to Novacut, PiTiVi (the working editor many critics advocated directing resources toward), and GStreamer and Gnonlin (two underlying components in common). Onward to killing King Kong with FLOSS. 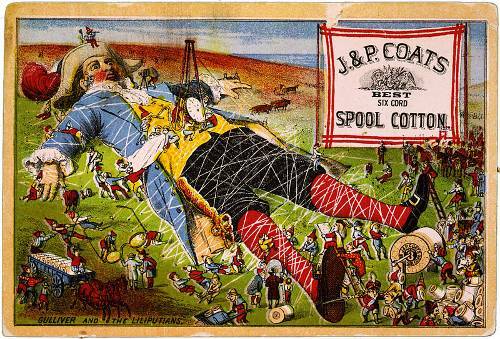 Gulliver and the Liliputans, trade card for J. & P. Coats spool cotton, late 19th c by Donaldson Brothers, Five Points, N.Y. / Public Domain. See my blog post on the CC site for more context. Also thanks to Nathan Yergler, who held the job for four years. I really miss working with Nathan. 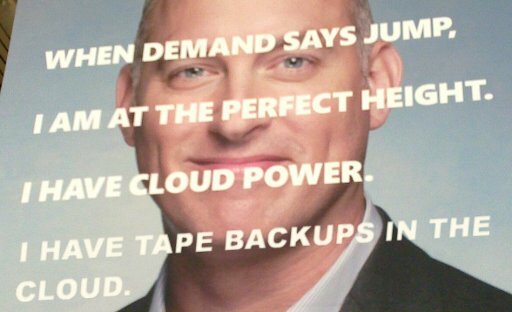 His are big shoes to fill, but also his work across operations, applications, standards, and relationships set the foundation for the next CTO to be very successful.